This recipe is one of the reasons why I don’t mind scavenging around under walnut trees on cold autumn days, because these toasted walnuts covered in crispy toffee are absolutely delicious. Eat them as a tasty snack on their own, or chop them up finely to use as cake decorations, dessert topping, or sprinkle over vanilla ice-cream. 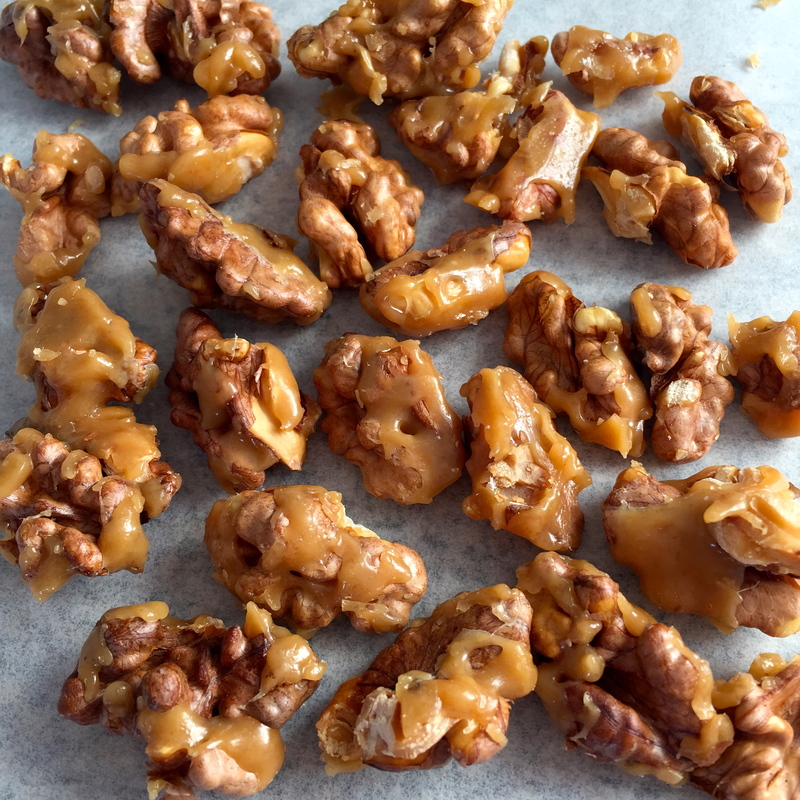 Place walnuts on a baking paper-covered oven tray and place in oven at 180 degrees Celsius for 8-10 minutes, until walnuts are dry and crisp, then set the tray of walnuts aside, making sure to arrange the walnuts in a single layer and close together ready to be covered with the honey toffee. Pour the hot toffee mixture over the prepared walnuts (drizzling it over rather than completely covering the walnuts). Work quickly with a fork to separate the walnuts so they set as separate pieces. Note: You will not need all the toffee mixture so with the remainder, pour it onto the baking paper and spread in a thin layer. When the toffee is set you can snap it into small pieces of honey toffee.